The Canadian Baby: Moving Forward! I feel like it's high time for an update post, since things are progressing and everyone keeps asking us what is going on. So without further ado, here is where we are at. We are finished our homestudy! This has been ongoing since May and it feels awfully nice to finally be finished it. I realize that not everyone knows what a homestudy is and what goes into it, so I plan to write a post with some more info and give you an inside scoop of what we went through. To sum up the last few months, we have completed the mandatory training and the homestudy, and have also raised enough money to pay for an adoption. Which means we are adopt ready and could technically accept a match at any time! This news in itself is pretty darn exciting. The only hitch is that we haven't really advertised much yet, so that is what we are working on now. We have to put together a profile that we can then give out in book form or post online, for prospective birth mothers to see. The birth mother will choose us, so we need to make sure we are visible to her through many different avenues. We are currently working on writing up our profile, which is one of the hardest things I've ever written. There feels like there is so much pressure to write the right thing, so we are slow at getting this finished. Once it is done, we can then post it to some online sites that are designed to show birth mothers profiles of waiting families. Our profile will also be given to our agencies in book form to be shown to birth mothers who come in looking to make an adoption plan for their baby. Which brings me to our next item on our to do list, signing up with our agencies! We have chosen two to sign up with, JFJ Hope Centre Adoption Services in Mississauga and Beginnings Family Services in Hamilton. We figured being signed up with two agencies might up our chances of being found by a birth mother. 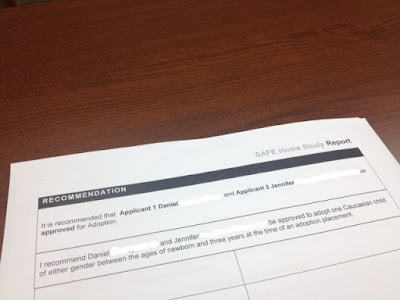 So there's the update, we are busily filling out paperwork and working our way towards being an active waiting family. Exciting!